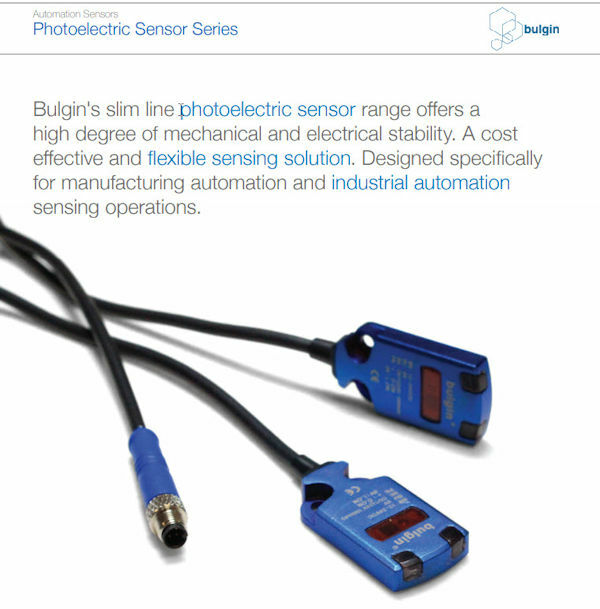 Bulgin New Slim Line Photoelectric Sensor Range | UK Electrical Distributors – E. Preston (Electrical) Ltd. The Photoelectric Sensor is an interface which converts a photonic input to an analogue or digital output. It can be used to detect distance, presence or absence of an object using a light transmitter and a photoelectric receiver. The new Photoelectric Automation Sensor Series is a diffuse reflective sensor which can be used to detect objects up to 40mm away. • Simple, secure and efficient design. • Only require one sensor for your system as opposed to using other technology, such as retro-reflective or through beam. • Achieve a watertight and dustproof seal to any standard M5 interface. • Highly robust casing material Stainless Steel 316. • Withstands a high degree of physical impact. • Vibration tested to 10-50Hz double amplitudes. X.Y. Z. each direction 2 hours. • Shock and Bump tested to 1000m/s², X.Y.Z. each direction 6 times.